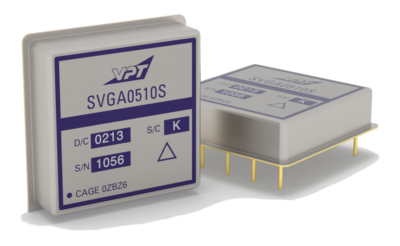 SVGA0510S Point of Load DC-DC Converter | VPT, Inc. The SVGA Series is an extremely efficient point of load DC-DC converter for stepping down voltage at the point of use. It is ready for rugged duty with characterization to 100 krad(Si) total dose radiation under VPT’s certified radiation program per MIL-PRF-38534, Appendix G.
Guaranteed TID performance to 100 krad(Si) including ELDRS, per VPT’s RHA plan specified per MIL-PRF-38534, Appendix G, Level R 100 krad(Si). After radiation exposure, converter testing is performed at 25°C per standard datasheet limits. SEE characterized to 85 MeV-cm2/mg with minor transients only; no dropouts, shutdowns, latch up or burn out.